This post details the design and operation of your professor’s example web service for the programming assignment’s “Option 4”. While this post covers the process of coding the web service for the programming assignment’s “Option 4”, it will also be valuable if your assignment covers a different option. Use the section headings below to guide you, and substitute your data model and web service goals when reading the narrative. In your assignment, no matter what option you select, it is expected that you will end up coding approximately thirty (30) or more URI templates / methods. Use the similarly-named section in the previous post (“Database for the web services programming assignment”) to help you understand the database, and/or to help you create your own design. The first task for any data-backed web service is to create the Entity Framework (EF) data model. You have done this many times before, so the process will be familiar to you. When you briefly look at the data model for the School of Information and Communications Technology (ICT) database, you will see about eleven (11) entities. One of those is an entity for the “ProgramSubject” junction table. It appears in the data model, because the database junction table includes a column that doesn’t appear in either the Program or Subject entities. Notice also that the other database junction table doesn’t have an entity. This is because the database junction table included only foreign keys that pointed back to the Employee and JobDuty tables. Entity Framework supports many-to-many relationships easily. So, in summary, the model has ten (10) entities. Therefore, your task is to create URI templates, and the methods, which will return entity objects. Logically, you need a URI template that returns all of the entity objects, as a collection. Additionally, you need a URI template that returns a specific entity object, identified by its <entityname>ID property. Completing this task will yield twenty (20) URI templates / methods. Obviously, the method return types will be List<entityname> for the collection, and <entityname> for the object. When returning the collection, you can decide whether to sort (“orderby”, with an optional “descending” modifier) the results. Now it’s time to study your data model in more depth. This process will reveal the need for more URI templates / methods. It is very important to know and understand your data, and its meaning. When you study the data model, and anticipate how consumers can use the web service, you will easily discover the need for many more URI templates / methods. Some of these ideas are covered in the following sections. When you studied the data model, you noticed that every entity had an <entityname>ID property (e.g. ProgramID, SubjectID). The corresponding SQL Server database columns are the primary keys, of type int, and they’re configured as auto-incrementing values. For some queries, this “ID” property doesn’t carry much meaning or utility. For other queries, doing a lookup by an auto-generated ID value doesn’t make much sense. Therefore, a good first place to start is to look at each entity, and think about one or more “natural” ways to query for an object, or a collection of objects. For example, if you’re interested in a specific course, it’s more natural to make a query that includes its course code, or course name. In summary, just ask yourself how you would like to query and consume the data – that will help you create URI templates / methods. After going through the 10 entities, you will conclude that it is very easy to create another 20, 30, or more URI templates that implement these ideas. Many entities are easy to identify in a unique way. For example, a specific subject (e.g. IPC144) is known uniquely as “IPC144” or “Introduction to Programming Using C”. This fact and observation makes it reasonably easy to contemplate and then design URI templates / methods that enable easy and logical querying. Employees are somewhat different. Why? Its possible and common that two or more people share the same first name or last name. In the School of ICT, the first name + last name combination is typically unique, so you can build upon that. If you look at these method descriptions, you will see that they meet different needs. Consider a consumer, who wants to query for a specific professor. The consumer knows only the professor’s last name and first name. The first step may be to ask for the number of employees who match the supplied last name of the professor (query #1 above, which uses the Count() method). If the return value is “1”, that means that a unique match was found. A second query (#3 above) could then as for the first (and only) employee that matches all or part of the supplied last name and first name. However, what if query #1 above returns a value more than “1”? The use case is slightly different, but not all that different. The bottom line is that you must know your data, and anticipate how the data will be used. Now it’s time to learn a bit about coding a query for a many-to-many relationship. A program can have many courses – we know that. We also know that a course can be a part of many programs. Let’s attempt to answer this question: What programs include the IPC144 subject? First, we must return a collection of Program objects. That will be the method’s return type. Next, we must accept a “subject” argument. For the example method shown below, we will accept a SubjectID value. Your method, in your programming assignment, may work the same way, or it may accept a subject code (or some other) argument. Then, decide what the focus of the query must be. In a model that includes a junction table, this junction table is the target of our query. So, we ask for an object set where the subject ID matches the supplied subject ID value. Then, we use the entity’s “Program” navigation property effectively select the program object for each item in the object set. Check out the sample code below. Notice the “as Program” clause in the “select” component – it enables you to assert that you want the query type to be “Program”. Now, you should be ready to code the answer to this question: What subjects are in the BSD program? An employee can have zero or more additional “job duties” – these are job duties over and above those included in the job title idea. Also, a job duty can be assigned to zero or more employees. So, how do we answer the question: What employees have been assigned a specific job duty? The Employee entity has a “JobDuties” navigation property. This means that the JobDuties property is a collection of JobDuty objects. 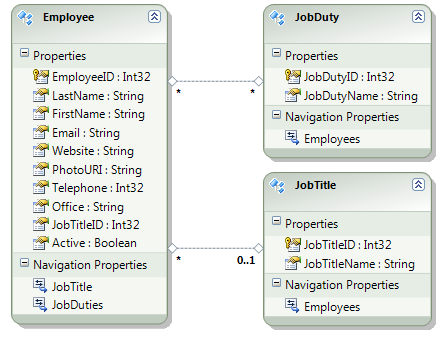 Looking at the JobDuty entity, we see that it has an “Employees” navigation property. This means that the Employees property is a collection of Employee objects. We can begin our query by focusing on either entity, but let’s start with the Employee entity, because that’s what we want for our result set – a collection of employees who have been assigned a specific job duty. First, we query the employees; its object set is represented in the code example below by the e variable. Then, we query again. Notice the second “from” component. We look at the JobDuties property in every employee, and look for a JobDutyID match. See the code sample below. At this point in time, you should be prepared to code any methods that you need. The database tables were designed so that each one included an “ID” column, for an auto-generated key. This may or may not be “real world”, but it enabled me to introduce a fairly simple and understandable abstraction. This feature will prepare you to use more complex models in the future. As you can see, the results are good and meaningful, but they may not be ideal for the consumer. Think of how the results could be used. You may want to improve these results by doing the “decoding” before sending them out. For example, you can convert a “course ID” value into a subject code, section letter identifier, and semester. To do this, you can create a “custom class” to model the data that you want to return. You have already studied the classes that were generated for your EF data model, so you know that they’re simple classes, with simple properties. Our custom class can be as simple. Now that we have this model object defined, we can return it, as an object, or as a collection of objects. Therefore, let’s modify the standard URI template / method, which anyone can write, and use the custom entity to “shape” the results into something more friendly and usable. We begin the query in the usual way, by selecting from CourseSessions, with the proper “where” component. In the code sample below, the variable “c” represents the set of matching CourseSession results. For each “c”, walk the object graph to get the data you want; e.g. c.Course.Subject.SubjectCode will return the (string) subject code. The results of the query are shown below. Much friendlier, and easier to use (probably!). In this post, you learned how to approach the job of creating a non-trivial, and significantly-sized web service. We covered coding techniques for methods that expose URIs that are useful to consumers. Along the way, you learned how to study a data model, and anticipate the usage of the data, to design and implement a set of web service URI templates / methods.